I had a fairly spotty source for gaming materials back in 1980–1981. My aunt and uncle in another town over had a variety store, and my cousins stocked one corner with TSR products. I’m not sure how much money they made on it, because they were probably their primary customers, and I and my brother got the family discount. That’s where I first picked up AD&D material, the Players Handbook, which added a third ruleset to our hybrid game, adding to the Holmes Blue Book that our DM had and the Moldvay/Cook Basic/Expert boxes that I got for Christmas. I don’t recall ever seeing the Dungeon Masters Adventure Log back in the day. I must have heard about it, as I attempted to recreate the basic idea for some of the games we played—mainly Men & Supermen. The Adventure Log is very much focused on dungeon adventures, with its emphasis on light sources and marching order in corridors. Each set of facing pages has space for listing characters on the left, and monsters/adventure information on the right. 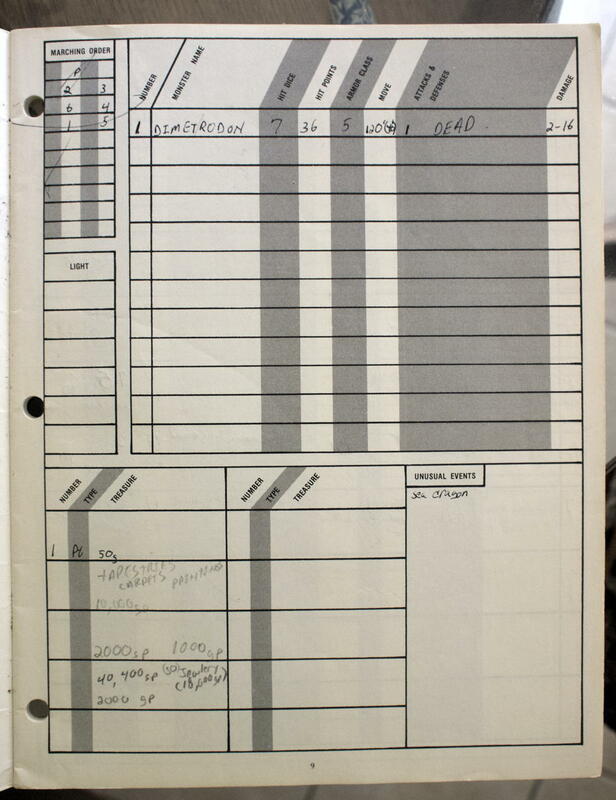 Pre-computer, this sort of thing would be very useful for recording what has happened to the characters in the past, as well as providing a summary of the last adventure for the DM to plan the next adventure. Some of the other useful features are illustrations of common armor types as well as some of the less common weapons, that is, the weapons that players might not be able to easily envision. This means lots of pole arms for the most part. Back in the day, I used to wonder at TSR’s obsession with pole arms—so many illustrations were these weapons we never used. But in retrospect, everyone knew what a sword looked like, and few of us knew what a glaive-guisarme looked like. It made sense to overload the illustrations with more obscure weapons. Another useful feature for those of us starting games from scratch would have been the example of use. It contained what looked like—and probably were—real characters from real games. The Adventure Log also has lots of tables that may be useful during play, such as chances of encounters per terrain, chances of becoming lost, movement rates for various forms of movement, and so forth. The examples of calculating surprise emphasize just how ad-hoc and annoying the surprise rules were in AD&D. Interesting to me are the combat modifiers. It includes rules I’ve never seen before for AD&D, such as combat modifiers for emotions. I remember that there were combat modifiers for intoxication from the Dungeon Masters Guide, but not combat modifiers for hate (other than species-based hatreds that came from choosing a race) and rage. I’m pretty sure that if I had had one of these back in the day, I would have used it regularly. Nowadays the record-keeping aspect of it is better handled by a computer that can allow searches several sessions later when no one remembers where that ant-covered ring came from. But there must have been a sense of accomplishment as a binder on the DM’s shelf filled up with logs of grand adventures. In this case, it looks like the group using this log had only one or two players other than the GM, and they doubled and tripled and more on player characters. They may have had a lot of GM-run characters as well. On one side, a summary of the characters in the game; on the other, a summary of what happened. And interspersed with rule tips and even, as far as I can tell, new rules. Tracking what happens cross different sessions helps me not to forget important details, as well as obscure details that become important later. Men & Supermen is a superhero role-playing game designed for a wide variety of characters, both of powers and power levels. Palace of the Silver Princess and my own Isle of Mordol were two of the very first adventures I ever ran. Because of this, I remember them both more than other, later adventures, and they influenced me more than other, later adventures. How do you maintain consistency in a “plot” that is not under your control? The Dungeon Master’s Adventure Log last modified June 27th, 2016.